28Pages.org is determined to bring about the release of a 28-page finding on foreign government support of the 9/11 hijackers. The current focus of our activism is on getting members of Congress to read the 28 pages themselves. Why? Because we’ve observed that doing so tends to instantly transform legislators into cosponsors of House Resolution 14, which urges the president to declassify the 28 pages. To that end, we’re asking concerned Americans to write or call their House representatives to urge them to cosponsor H.Res.14 and ask if they’ve read the 28 pages or asked permission to do so. If you’re wondering if it’s worth your time, one look at this letter should convince you it is. 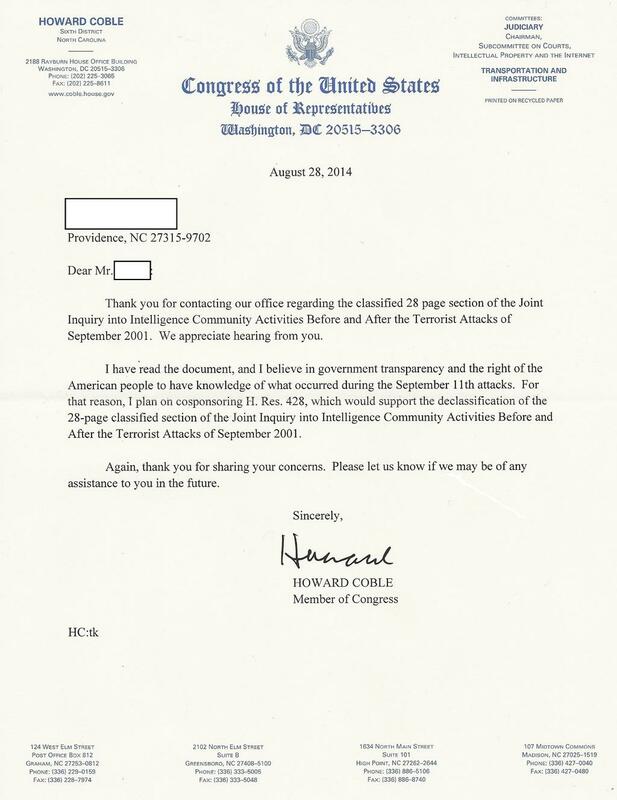 28Pages.org commends North Carolina Congressman Howard Coble for reading the 28 pages, for his responsiveness to his constituent, and for his intention to join the growing, bipartisan list of cosponsors. Call or write your House representative today—and please share this post on Facebook, Twitter and other social media.